This beautiful three-floor penthouse to rent is situated in the heart of the popular residential neighbourhood of Kolonaki, on the corner of Voukourestiou Street. From the living room, balconies and terrace guests can enjoy spectacular views of the Acropolis to the east, and views of the Lycabettus hill to the west. In the evening the Acropolis is lit wonderfully from below, breathtaking as it towers above modern Athens. 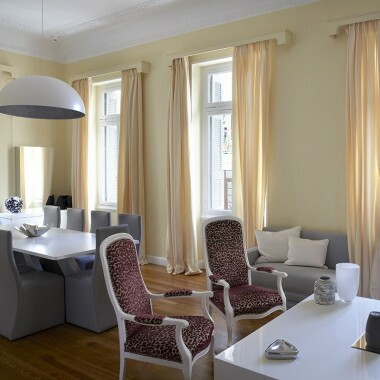 The flat has been beautifully restored, maintaining all the elements of the original architectural design. The 5th floor has three large bedrooms with double beds and two bathrooms. The 6th floor has a large living room, dining room, an office/studio, a WC and a spacious kitchen. The 7th floor has an additional small room - with a fourth double bed and a third small bath. From the 7th floor you can step out onto the spacious terrace which also has a small room with sink and a fridge. Part of the large terrace is communal, but the part with the amazing views belongs to the apartment. Further amenities include central heating, air conditioning, Wi-Fi, a washing machine/dryer and a hairdryer. There is lift access to the apartment. 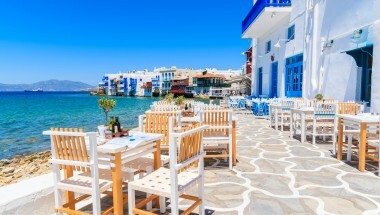 The vibrant area offers a great selection of shops and restaurants, character-filled coffee shops like Filion and Desire, an excellent greengrocer, and a supermarket (Agrotiki Gonia) where some of the best feta in Athens can be found! It is also ideally situated to experience the cultural and shopping life of the city. Only a few minutes’ walk is the Benaki Museum, the Cycladic Museum, the Byzantine Museum and at a 15 minutes’ walk distance the Acropolis Museum. A short walk will also bring you to the commercial center near Syntagma square, the busy Ermou shopping street and further down to the old central market with fresh meat, fish, spices and vegetables daily. You can enjoy a drink at one of the bars and bar-restaurants of central Athens, around Kolokotroni street, Aiolou Street and further away (15 walking minute distance) in the historic neighborhood of Plaka. A unique experience in July would be to attend one of the performances at the Roman Theatre of Herodes Atticus, directly beneath the shade of the Acropolis. Large living room. Dining room (seating 8). Office. Guest WC. Spacious kitchen (Bialetti cafetiere, kettle, dishwasher, stove top, oven, fridge/freezer). Small double bedroom and bathroom. Maid service upon request. Airport chauffeur upon request. 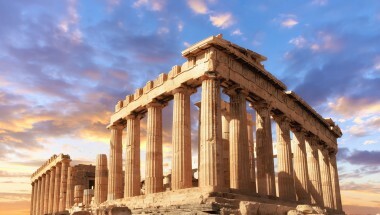 Archaeologist upon request to offer unique cultural tours of the interlocking web of Ancient, Byzantine, Medieval, Venetian and Frankish Athens, as you walk through the modern city and experience the blend of past and present at every corner. This beautiful three-floor penthouse to rent benefits from stunning views of the Acropolis from its terrace, particularly spectacular in the evening. It is situated in the populal neighborhood of Kolonaki, with easy access to shopping and dining options, and many historic sights of Athens. Prices are based on full occupancy of 8 people. Please check with us for prices for fewer people. Final Cleaning fee of €70 to be paid locally.